The world of software occasionally produces fruitful rivalries between applications that try to solve the same problem with different approaches: Omnifocus vs. Things, Alfred Vs. Launchbar, Rdio vs. Spotify, etc. These rivalries are great for consumers because each application is forced to hone its own approach and polish its unique features. In the read-it-later space, the two dominant players have long been Instapaper and Pocket. Each app has its own strengths and weaknesses, and Pocket has some features that could make it the ideal app for some use cases, but Instapaper is our favorite app for actually reading the best writing on the web … later. I started buying my first PDAs and smartphones back in the early 2000s, and I immediately began trying to hack together a way to read long-form articles on these mobile devices. I would actually copy and paste articles from the internet into text documents, and then use various apps to read those text documents. It was a terrible solution to the problem that read-it-later services finally solved on the iPhone and later the iPad. The problem is this: the internet overflows with amazing things to read, but a computer is not a great device for reading. It’s much nicer to curl up on the couch with a mobile device like a phone or a tablet. But even more importantly, you don’t always have time to read an article the first moment you come across it. Ideally, you could have a place to store those articles for later when you actually have the time to curl up on that couch. Depending on the website, reading on the web can often be a hostile experience with distracting ads, over-pagination, requests to sign up for newsletters, and spammy “promoted stories from around the web” cluttering up your reading and making you question the moral fabric of human civilization. 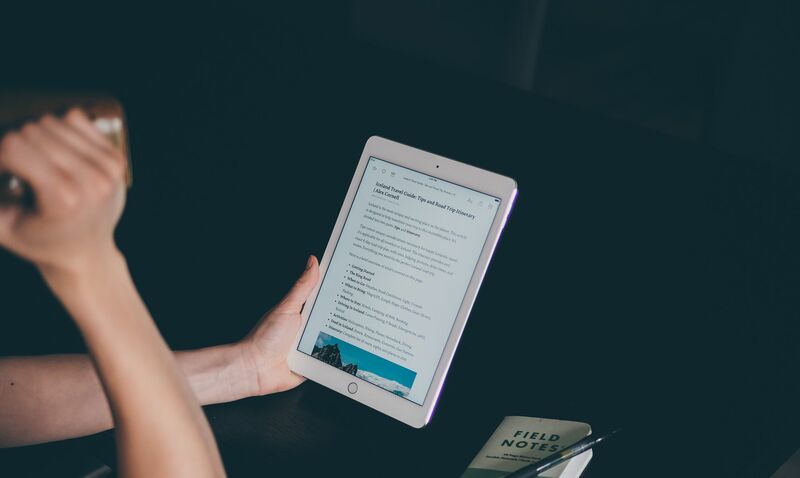 Read-it-later services can solve all of these problems, helping you save articles to read on your preferred device in a much friendlier, more beautiful format. You could think of these services like Tivo for the Internet. As you browse the web during the day, you can pick and choose the things you want to read, and at night, instead of continuing to browse, you have a hand-picked selection of great material ready for you to read. Reading Experience: Since the purpose of these services is to provide a better reading experience than the web, how does each service present that experience to the reader? Organizational Options: How can one sort through the items that have been saved? Can they be sorted and organized in different ways? And how easy is it to find an item that’s not at the top of your list? Save Method: How easy is it to save items to read later, and what options are available as you save them? Multimedia: How does each service handle material beyond words like images and video? Cross-platform Support: How well does the service work with various devices, and how easy is it to export items out to other services? Curated Content: How does the service help you find new things to read? Social: How easy is it to connect with other readers through the app or to share material out of the app to your various networks? Price: What additional features do you get for a paid subscription? Instapaper got a head start in the read-it-later space because it was the first such service with an app on the iPhone, and it changed the way a lot of people read. Suddenly, you no longer had to “surf” aimlessly through the web. Instead, you could hunt and gather up writing of real value and collect it all into a single, perfect magazine, just for you. For the past few years—following over a decade during which I read way more href tags than actual prose paragraphs—my life has gotten better, in part, due to Instapaper. I’ve finally gotten my hands around this “too much stuff” issue, at least insofar as it relates to words of theoretical interest. Now, I know where it goes. It goes into Instapaper. 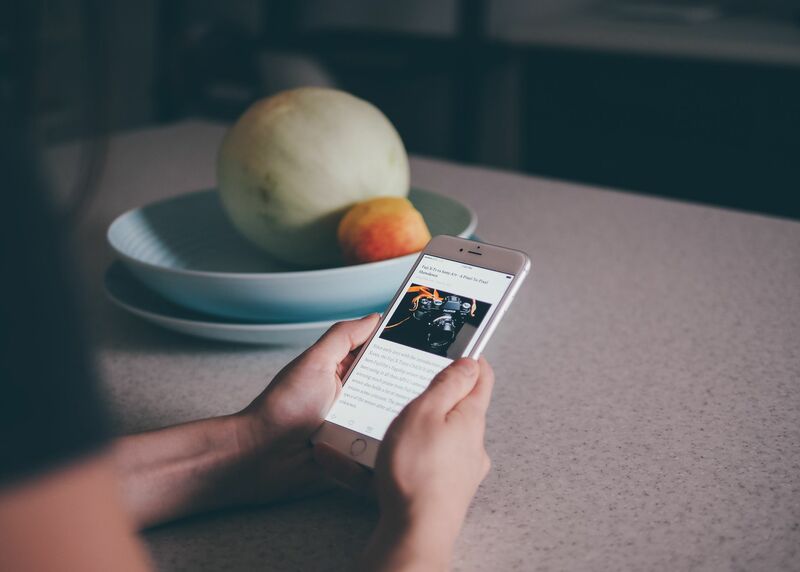 Instapaper has evolved over the years, but it remains our favorite read-it-later service because of its relentless focus on that primary purpose of the app: reading. 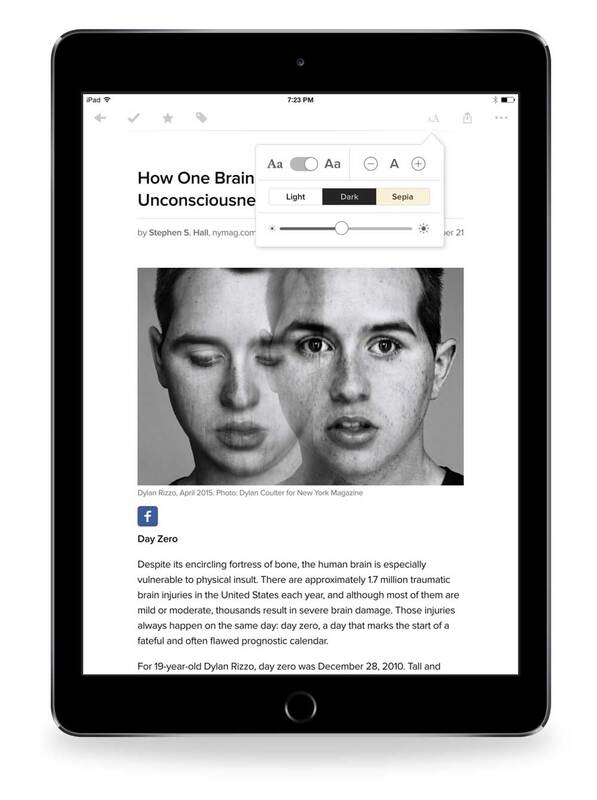 Marco Arment, Instapaper’s creator, often talked about his desire to give the app luxury-car-like features: features that might seem subtle, but that made a huge difference for the overall experience — specifically the reading experience. Since Instapaper’s acquisition by Betaworks in 2013, those features have only been refined and expanded. First and foremost, on iOS, the app has rich typographical options, fourteen fonts total, several of them specifically commissioned for the app. There are beautiful, distinctive serif and sans-serif fonts, along with more common fonts like Baskerville and Palatino, and even Dyslexie, a font specifically designed for readers with Dyslexia. To my knowledge, no other reading application of any kind (from e-books to RSS readers) offers such an array of options for readers. 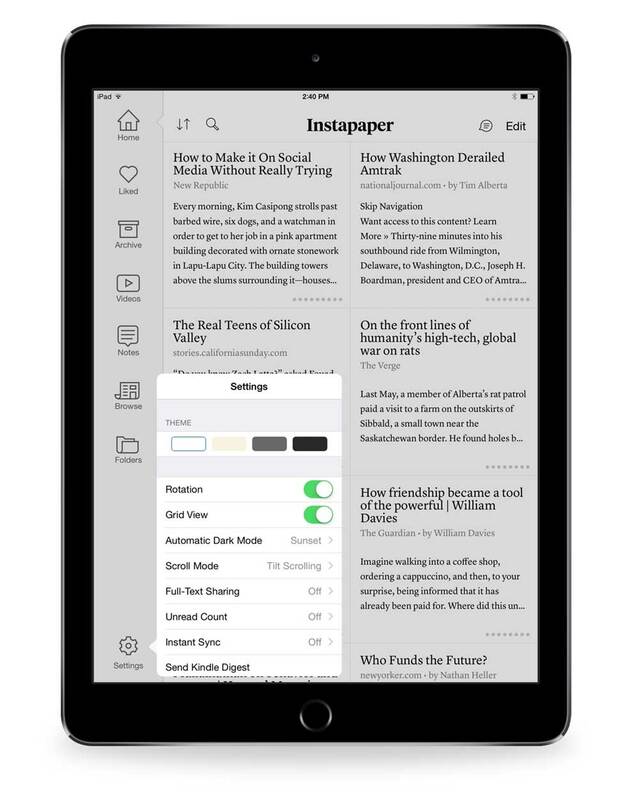 Like many apps, Instapaper also allows you to control the background of the app, whether you want a white background with black text, a black background with white text, black pages with white text, or something in between. But the app also has the option of switching from a white background to a black background based on the time of day. That way, if you open the app in bed at night, you aren’t assaulted by brightness. And there’s a Twilight option to make that change in steps, from white, to sepia, to black, as the sun goes down. And one of my favorite features of the app is the ability to independently control the size of the type, the spacing between lines, and the margins around the text. These might seem like fiddly, unimportant features, but they have a huge impact on the reading experience. 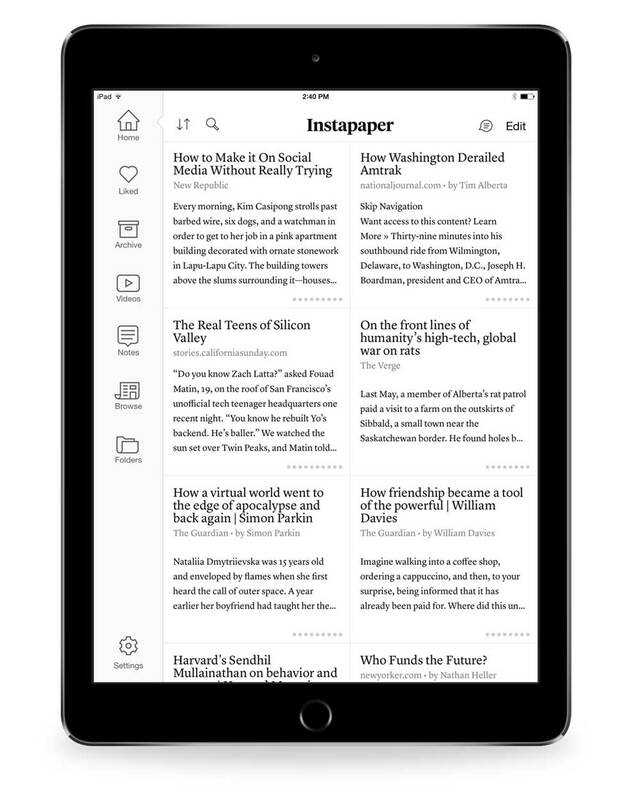 Whereas many e-reading apps and devices offer inferior reading experiences to traditional print, Instapaper arguably offers a reading experience that’s as good if not better than print, simply because it can be customized to the particular tastes and needs of the reader. The default method of organization in Instapaper is sorting articles by when you saved them, newest to oldest or oldest to newest. You also have the option of sorting your articles into folders. But more recently, the app introduced the ability to sort by length, read progress, or popularity. And you can shuffle your articles to see if you saved anything a while back that you forgot to check out. 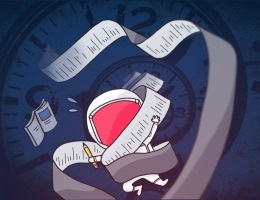 Of course, a read-it-later app is no good if you don’t have anything to read later, and in the early years of Instapaper you had to be slightly nerdy in order to get that to work. You could install a bookmarklet in your Safari toolbar on your Mac, and a much fussier bookmarklet in your Safari toolbar for iOS. And in Twitter clients and RSS readers, you just had to hope a “save to Instapaper” option would be available. But now those hurdles are (mostly) a thing of the past. 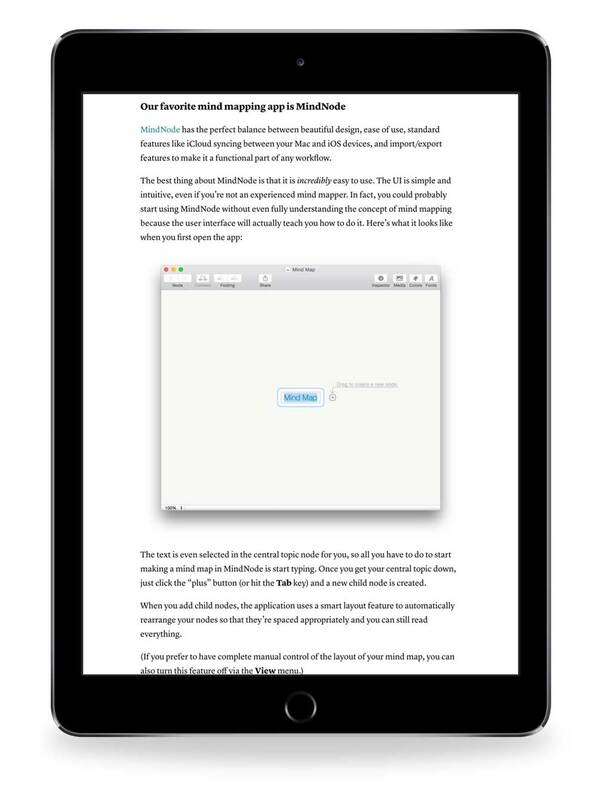 Instapaper now offers a Safari extension for the Mac. And on iOS, Instapaper is available as a share extension, so as long as the app you’re using supports the share sheet (Twitter being one notable holdout), you can easily save anything you’re reading to Instapaper from that app. And if you like to organize by folders, you can save to those folders from the share extension itself. Instapaper also offers the ability to save articles via email. 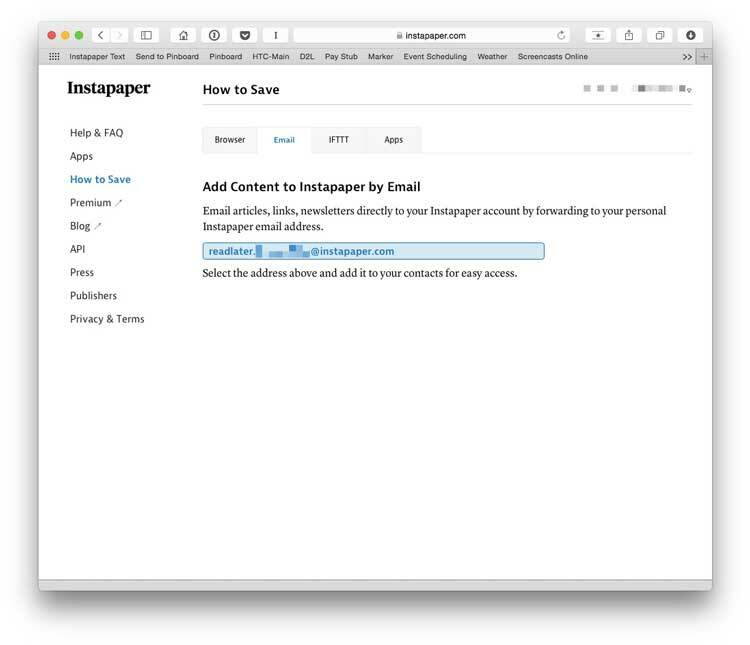 To use this feature, you have to log into Instapaper’s website, click More at the bottom of the page, select How to Save, and then Email. You can then copy the unique email address for your Instapaper account, add it to your contacts, and anything you send to that address will show up in Instapaper. This is especially handy for email newsletters you’d prefer to get out of your email inbox and into a friendlier reading environment. I also find it useful when doing research through my public library’s magazine database. I can email articles from the database to my Instapaper address and read the articles there. 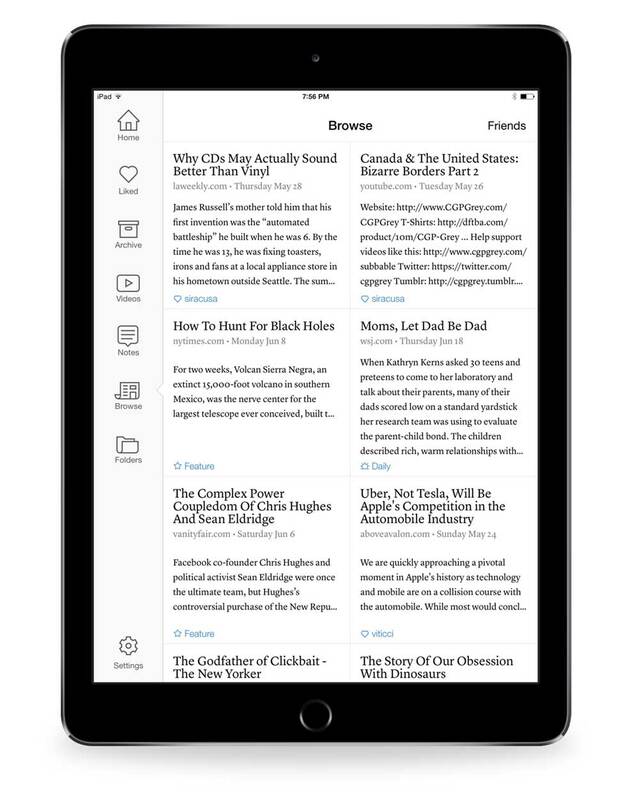 Another way of getting items for your Instapaper queue is through the app’s Browse section, which suggests articles for you to read. There’s also a slightly hidden social function that allows you to follow other Instapaper users if they’ve decided to make their accounts public. In the Browse section, you can tap on Friends and search your Twitter and Facebook friends to see if anyone has a public Instapaper account. Then, whenever they like an article, it will show up in your Browse section. You can control whether your Instapaper profile is public in settings. Finally, Instapaper also ties into the web automation service IFTTT. So if you use a service like Pinboard for bookmarking items on the web, but you only want some of those items to show up in Instapaper, you can set up a recipe that says, “If I tag an item in Pinboard with the word ‘Instapaper,’ add this item to Instapaper.” Or if you’re a Tumblr user, you can set up a similar recipe that sends liked items on Tumblr to Instapaper. And so on. IFTTT recipes for Instapaper can also go in the opposite direction. For example, you can set up a recipe that if you like an item in Instapaper, the item will be bookmarked in a service like Pinboard. But you can also set up these kinds of sharing services within Instapaper itself. For example, you can connect a service like Evernote to Instapaper so that every item you like in Instapaper is archived in Evernote. Additionally, you can link your Instapaper account to your Kindle account, so that on a regular basis, your most recent batch of 25 or 50 articles show up on your Kindle, in case you prefer reading in that format. You can set up all these services on the Instapaper website’s settings page. 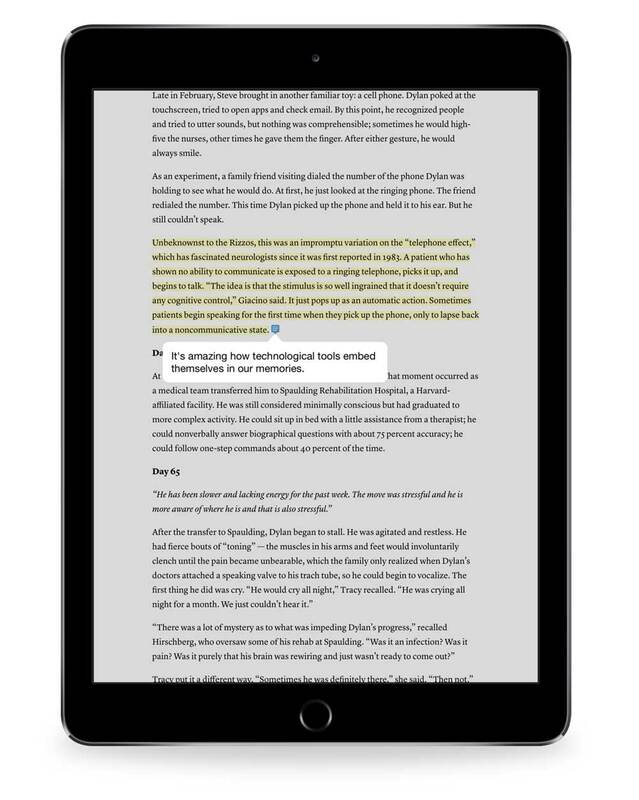 One of the recent additions to the app is the ability to save and share individual passages of articles with Instapaper’s new highlighting functionality. In iOS, select some text in an article, and you’re given the option to copy, look up in a dictionary, highlight, create a note, or share. 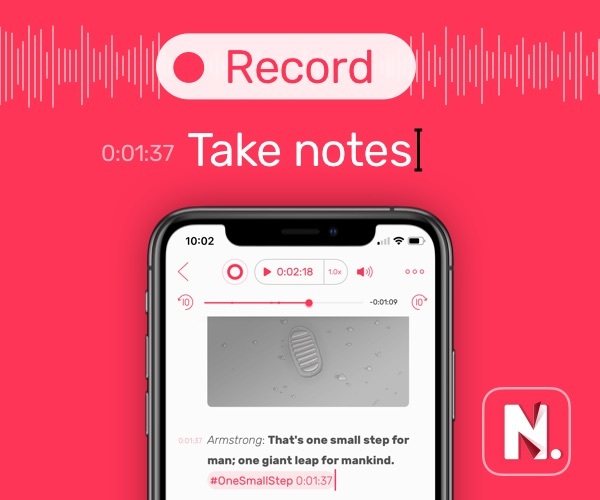 Any notes you create are saved in the Notes section of the app so you can find them again easily. If you want to share your thoughts on Twitter, you can highlight a passage and then tap on the highlighted text. You then have the option to share a “Tweet Shot,” which will tweet out an image of the text you highlighted, along with your comment and a link back to the original article. 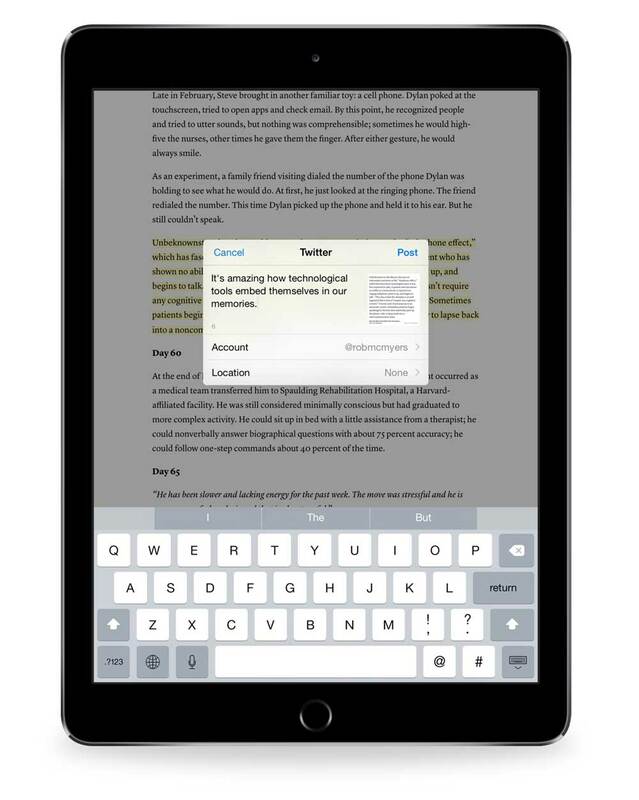 Instapaper Premium offers features including the ability to do full-text searches on all the articles you’ve ever saved and the ability to create unlimited notes within articles (the free version allows only five notes per month). The app also offers three new buttons in the iOS share sheet. 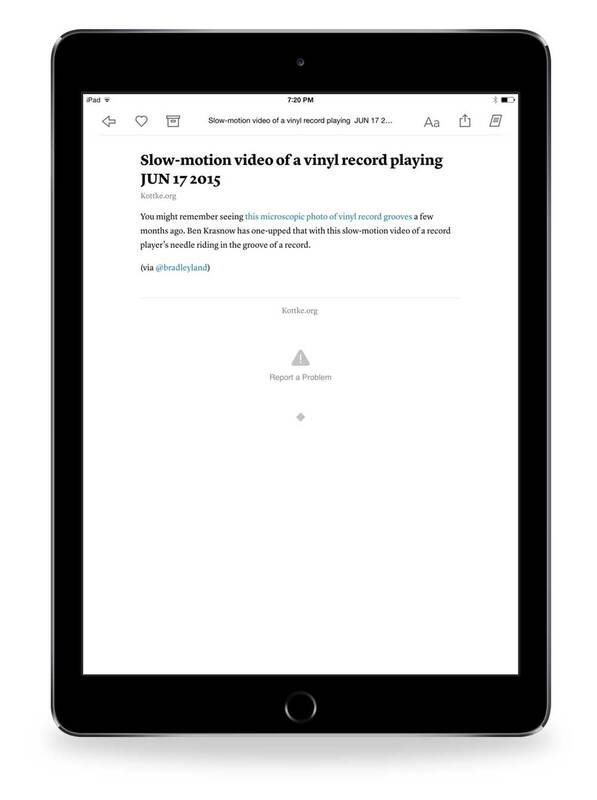 Tap the share button from an article in Instapaper, select Speed, and Instapaper will convert the article into a speed reading format, showing you one word at a time in whatever speed you choose. Send to Kindle will send the selected article to your Kindle (in case you don’t want to send articles in batches on a regular basis). Finally, if you select Speak, Siri will read the article to you. There’s even an Apple Watch app to control playback of this text-to-speech option. Premium used to be a paid upgrade, but was made free after the app was acquired by Pinterest. 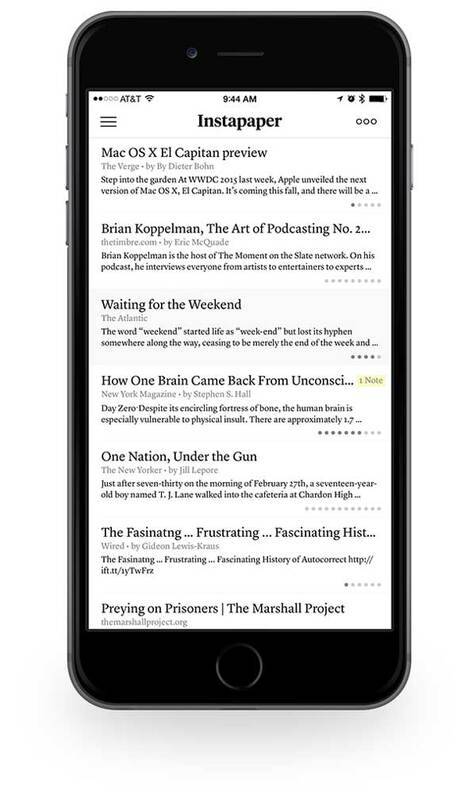 As great as Instapaper’s reading experience is, the app does have some weaknesses. Its biggest drawback, in my opinion, is how it handles images. Some articles, like a review from The Sweet Setup, show up in the Instapaper app with images intact. But other articles, like a review of the 20 Best New Sour Beers in the World, arrive in Instapaper with no images at all. 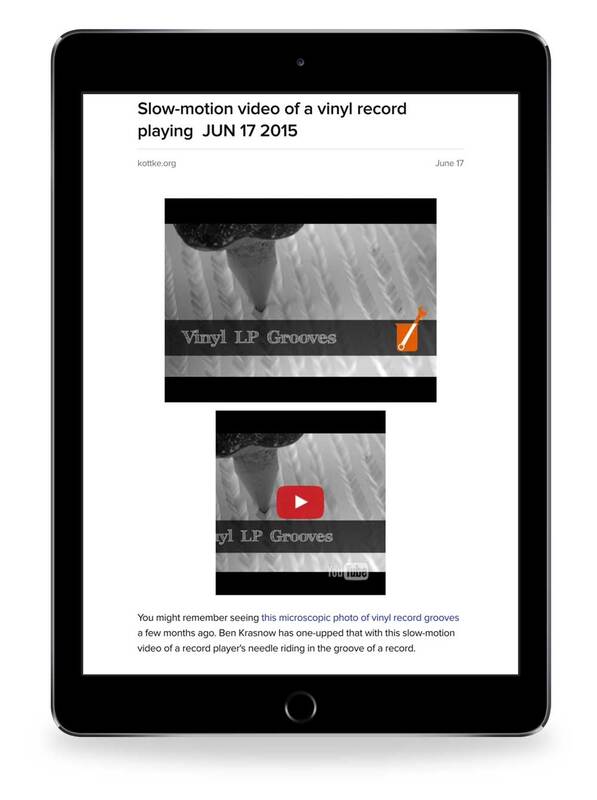 Instapaper also doesn’t do a great job with videos. There is a folder in the app for saved videos, but it only works if you’re saving videos directly from a video site like Youtube or Vimeo. If the video is embedded into a blog post from something like Kottke.org, Instapaper doesn’t recognize that it’s a video and simply saves the text. I also think Instapaper’s full text search could be improved. Right now, when I perform a search, I often have to wait quite a long time for a result, and the search sometimes fails completely. And even when it works, it only provides results that link to the web-based versions of articles rather than the Instapaper saved versions of the articles. There’s no way to easily find the Instapaper version of the article without scrolling through the titles. Lastly, I wish Instapaper would switch from folder-based organization to tag-based organization of articles. I’m not a tagging obsessive, but if I’m going to organize things, tagging makes so much more sense than folders. Folders just hide the items from the main view, whereas tags allow the ability for items to exist in the main view or be filtered into different categories. Items can even exist in multiple categories. Folders feel much more limiting. 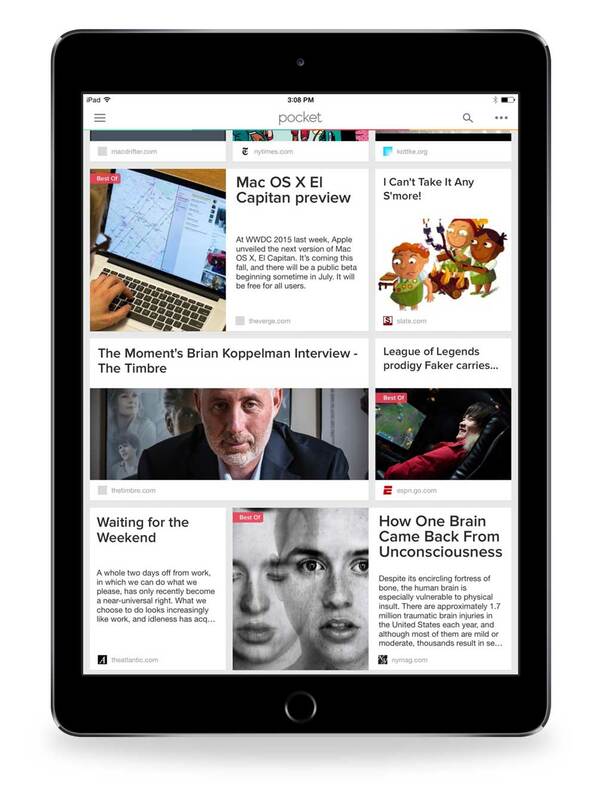 The app that addresses nearly all of my complaints about Instapaper is Pocket. At first glance, the most noticeable difference between the two is color. While Instapaper’s table of contents shows only titles and text previews, Pocket’s table of contents tries to offer a thumbnail image of each article, and the colorful, magazine-like layout can feel much more inviting. In fact, Pocket does a better job of parsing images in general. 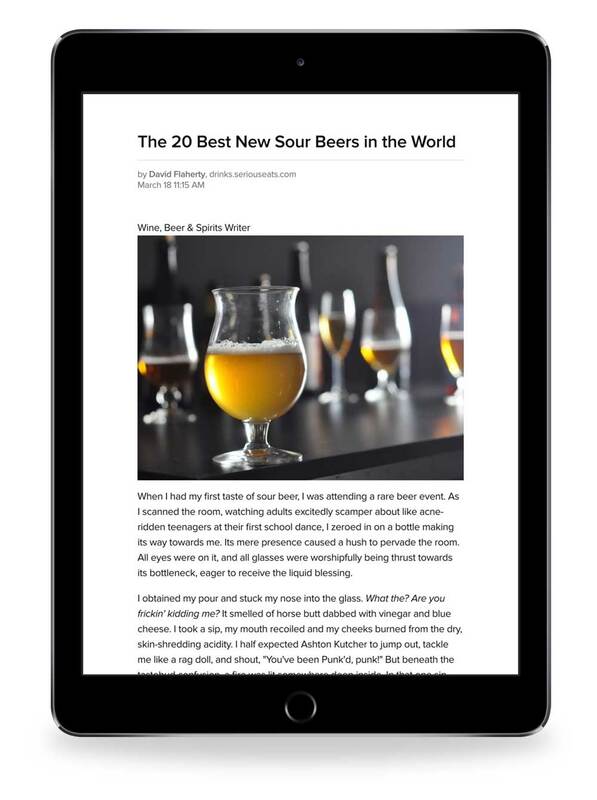 The review of sour beers I mentioned above had no pictures in Instapaper, whereas Pocket included all the pictures. Pocket also does a better job of handling videos. 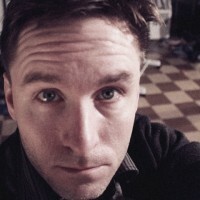 This link from Kottke.org to a video was missing the video in Instapaper, but Pocket saved the video and sorted the video into the video section of the app. Another advantage of Pocket is that it uses a tag-based organizational system. The various extensions for saving items on both the Mac and iOS let you add tags as you save, which is very nice. And if you use IFTTT, you can set up recipes that trigger based on specific tags, which is much more powerful and customizable than Instapaper’s IFTTT triggers. Pocket is free for the basic version, but if you upgrade to Pocket Premium ($5 a month or $45 a year, which is $15 more than Instapaper’s subscription fee), the app offers full-text search. Pocket’s search works better than Instapaper’s search in my experience, but that might be a function of how many more articles I’ve saved in Instapaper. Pocket’s subscription fee also gets you a “permanent” library (permanent as long as you’re paying) of everything you’ve saved, so that even if links to those articles change or disappear, you have a backup copy. Premium accounts also get access to “suggested tags” when saving an item to the service. It’s also worth noting that Pocket has a Mac App, which is nice if you’re sitting at your computer over lunch hour and want to call up something you’ve saved. Instapaper, by contrast, only offers a web view on the Mac. Pocket addresses some of the organizational and visual shortcomings of Instapaper, and can serve as a place to save not just articles but also videos and images from the web. 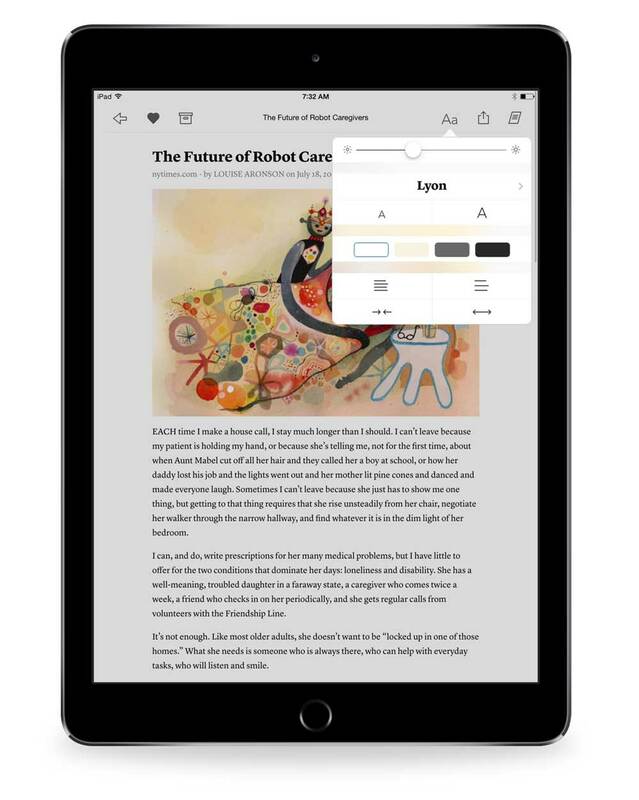 But, Pocket lacks many of the features of Instapaper, such as the ability to highlight, make notes, speed read, or convert the text to speech. There’s also no equivalent to Instapaper’s Browse section, offering suggestions of new things to read. However, its biggest downside is that it just doesn’t offer the same high-quality reading experience. You only get two fonts to choose from (serif or sans serif), and you can’t customize much else about the way text is displayed except for size. Whenever I’ve been tempted to switch to Pocket for the features noted above, I always miss the love and care that Instapaper lavishes on text. One way to think of the difference between the two is that Pocket might be the best app for saving things from the web, but Instapaper is still the best app for reading things from the web. That said, I come away from this review thinking I might start using Pocket as a research tool. Pocket’s tagging features, search capability, and permanent library make it an attractive option for when I’m compiling material to write about, rather than material I just want to read for pleasure. One app that could be a great supplement to a read-it-later service (in addition to functioning quite well on its own) is the app created by the website Longform (free). Started as a website where a group of journalists could recommend the best writing available on the web, Longform has since grown into a popular podcast and an app. The app features the same recommendations as the website and offers them in more readable formats. It’s not quite as nice to look at as Instapaper, but it’s certainly nice enough. You can browse the recommended articles, bookmark articles for later reading, and follow certain writers and publications to see what they’ve recently published. 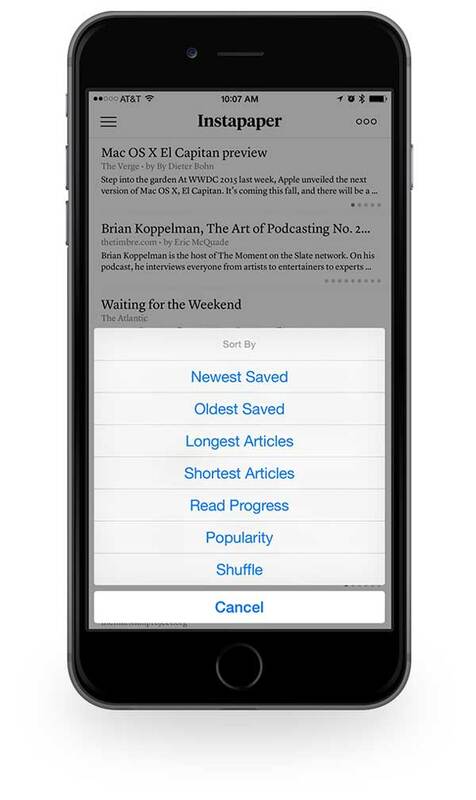 Best of all, if you prefer to use the app to find articles but not to read them, you can easily save articles out of the app into your read-it-later app of choice. Apple offered its own version of a read-it-later service when it added Reading List to Safari, both on the Mac and iOS. Whatever version of Safari you’re using, you can use the share button to add the item you’re currently reading to your Reading List, which will then become available on all your devices through the Safari bookmarks tab. In reality, Reading List is just a slightly fancier version of bookmarks. Tap on an item and you’re taken to the webpage. Once the saved webpage loads, you can use Apple’s optimized view of the article, but the service lacks any of the more advanced features of Instapaper or Pocket. It doesn’t save your place in the article you were last reading, but Reading List does save content for offline reading, which is a plus. Speaking of bookmarks, you could also leverage Pinboard, and the healthy ecosystem of apps around that service, as a read-it-later solution of its own. Like Safari’s Reading List, Pinboard is a way of bookmarking links on the web rather than saving text for later, but you can also tag those links, and for $25 a year, you can have the text of those links archived for full-text search and retrieval. If you’re fully invested in the Evernote ecosystem, and you prefer to use one app for saving everything, you could use Evernote as a read-it-later service. But, again, since the app isn’t designed for long form reading, it won’t give you any of the niceties of a dedicated app, such as saving your place in an article. For a while, Readability was one of the real competitors to Instapaper and Pocket. It was actually the first such app to offer high quality reading fonts like Whitney as an option. But it hasn’t kept pace with the competition. It does a fine job of the basic functionality without any of the extra features (like full-text search, speech to text, highlighting and notes) found in the other services. It’s also not a great sign that the “recommended” feature, which suggests articles for users of the app, hasn’t been updated since January of 2015. 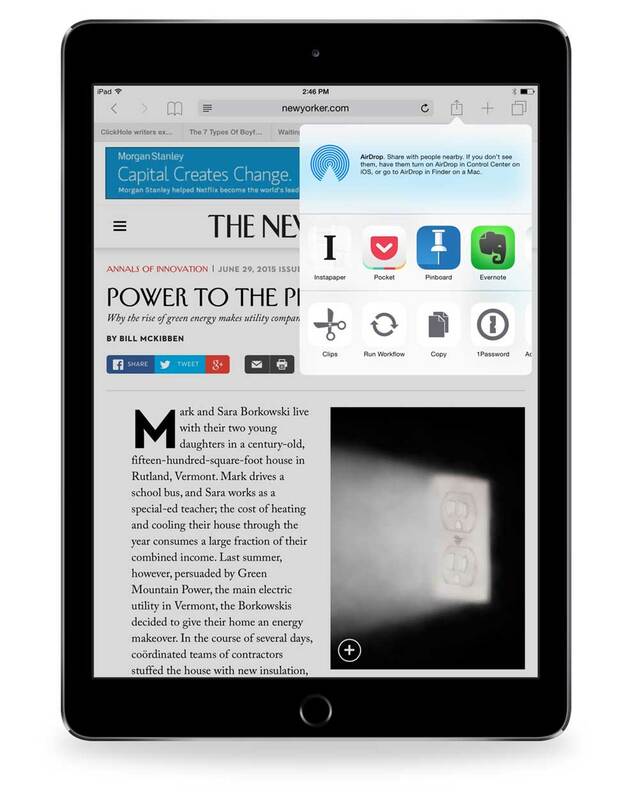 Instapaper has been one of the most recommended apps for iOS users since the App Store first debuted, and it’s no accident. It was one of the first apps on iOS to demonstrate the truly transformational power apps can have on a mobile device. Holding “the web in your hands” means something very different when you’re not just passively browsing that web but picking and choosing what parts of the web you want to hold and read comfortably on your couch. Other apps may do a better job of parsing images or organizing articles, but Instapaper does the best job of presenting the text of the things you want to read in the format you most enjoy reading. And that’s why it’s our favorite read-it-later service for iOS.